For those who have been following this blog, it must be really easy now. But, still I should give the details for the sake of completeness. Clearly, @string is a way to tell the compiler that the variable which will follow after a ‘/’ represents a string. This is necessary to distinguish the different types of variables. Yes! There are other kinds of variables which represent color, dimension, array, etc. Right now, I am not going to discuss how to use those variables. But, if you are one of those who really like to stay ahead, open the strings.xml and click on add. You will see the following dialog box. Now, it’s on you to explore! Also, the name that follows the ‘/’ is the name of the variable whose value is to be given to the android:text and thus, is to be displayed on the screen. 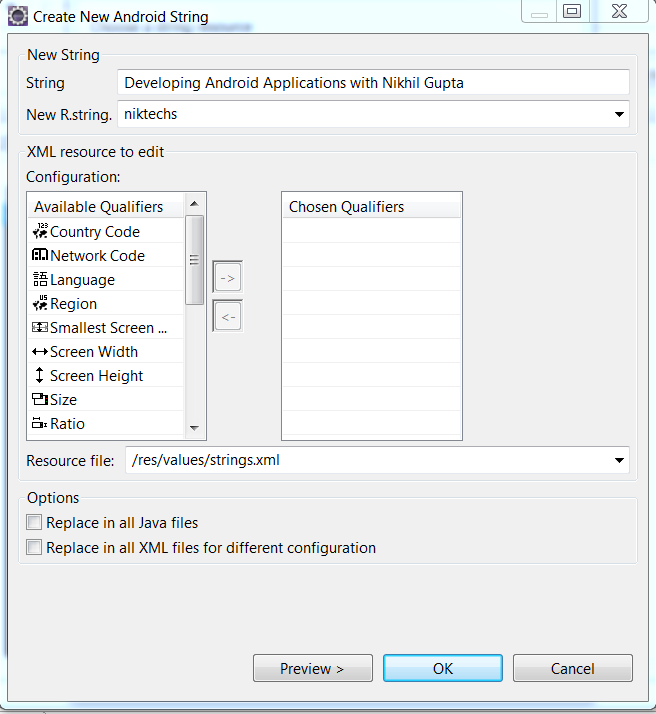 Here, since the name is niktechs, the text that is displayed on the screen will be same as the value of the variable niktechs which is Developing Android Applications with Nikhil Gupta. Now, I think I have laid the foundation of discussing the other way of changing the text on the screen. Remember, in the post titled Laying out the screen!, we saw how to use WYSIWYG to change the text on the screen. For a quick flashback, we used the edit text option and created a new R.string whose value was the text that we wanted to display. The other way results from our discussion in the previous post. There, I created a new variable of type string named Blog. Now, instead of using the WYSIWYG editor, we can simply change niktechs (in the code describing android:text attribute) to Blog and save the file. Now, look at the GUI (click on main.xml and then, choose Graphical Layout tab). What do you see? 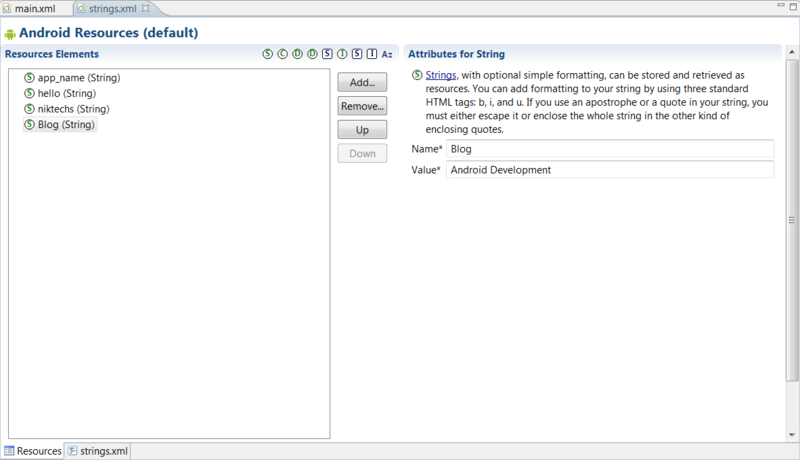 Yes, the text has been changed to Android Development which is the value of the variable Blog. Why does this happen? I hope that it’s now trivial for all. Since Blog is just another string type variable like niktechs (discussed in the previous post), replacing the two will result in replacing the values of the android:text attribute and hence, the text on the screen. So, we have looked at the basic layout features and understood each and every concept related to it. But there are various attributes that can be used in the code for layout which can greatly vary the screen. It’s up to you to explore them. I may discuss a few of them, but only in the later posts. If you want to explore, go to a tag, type android: and press Ctrl+Space. You will see the entire options that are possible. In the next few post, we will finally go into the JAVA coding. So, a lot more interesting stuff coming soon! This entry was posted in Layout (Android), Strings (Android) and tagged Android, Layout, Strings. In the last post, we looked at the code for the layout of an android application. But we didn’t discuss discuss the strange value taken by the text attribute of the tag “TextView” and how it decides the text display by this TextView. Were you able to find any correlation? In this post, I will discuss about strings in an android app. The concepts discussed in this post will be used to anwer the above query in the next post. So, let’s start! Click on the values folder (It’s in the same directory as the layout folder). Do you find something which is related to our interest? Yes, a file named string.xml. Let’s open it! What do you see? You can see that strings.xml opens up in an interactive editor. This editor is used to add Resources (to be discussed later) to our android application. For now, it’s sufficient to know that strings are treated as resources in an android app and hence, this editor allows us to make, modify or delete strings. We can see three Resource Elements (as specified in the header), all being of type String as mentioned in the brackets beside the name. Thus, our android application has three resources, all of them being strings. The names that are visible are the names of the variables that are used to store the string type values (similar to the fact that x is a variable used to store integer type values when I write int x = 10 in C). Thus, hello and app_name are two string type variables which are automatically created during the creation of a project. To look at the values stored by these variables, simply click on them. On clicking hello, you will see a panel in the right which displays the name of the variable and it’s value. Now, looking at the value of the variable hello, I hope that you can make out how the text displayed at the screen originally came about. Yes!, the value of this variable is Hello World, HelloWorldActivity!, the original text on the screen. You must have seen another line of text in the screen of the app. Look at the value of the variable app_name and try to find out the place at which it is used. Comment below if you are able to find it! Now, do you see why a variable named niktechs is there in the list? How it was created? Do you remember, while editing the text on the screen (Refer to the post Laying out the screen) , we made a new string variable? Yes, that variable is the same as displayed here. The value given to the field R.string there, is the name of the variable and the value is the same as given that time. Thus, when we changed the text displayed at the screen, we actually created a new string variable and gave its value to the TextView. As mentioned earlier, we can create a variable by using this editor. Simply click on Add. A dialog box opens up. Don’t be afraid to see so many options. We will look at them as we proceed. For now, simply select String. In the resulting window, simply set the name (let’s set it to Blog) and the value (I am setting it to Android Development) as required and save the file. This creates a new String type variable. We can modify a string by simply changing its value and saving the file. To delete a variable, simply select Remove. Thus, we have seen how to play with strings in an Android Application. What is left to discuss is how to use these strings in the app. How these variables relate to the text displayed on the screen? How it answers the query raised at the beginning of the post? All of this coming in the next post! This entry was posted in Strings (Android) and tagged Android, Resources Elements, Strings. 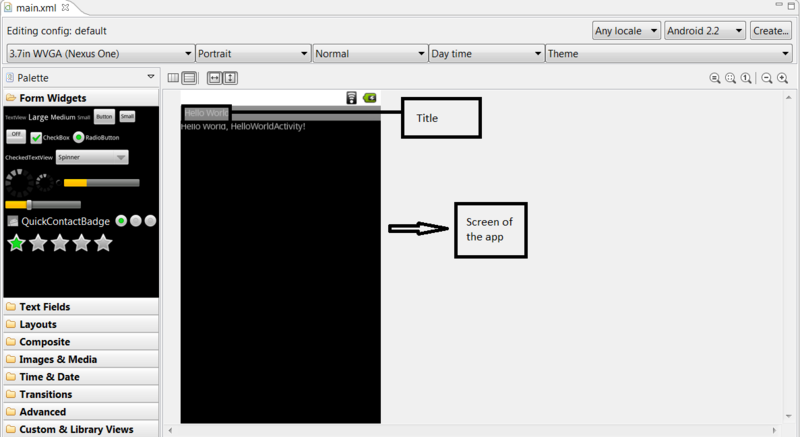 In the last post, we looked at the development of the layout of an Android app using the WYSIWYG editor. Now, it’s time to look at the code, which actually does the required work at the back end. Code?? Yes, every layout file has an associated code and the WYSIWYG editor simply executes this code to show a replica of what the screen actually looks like. The main purpose of this code is to declare all the components, set their properties and describe how they are related. The relationship is defined by a hierarchy where the lower components constitute the upper components. So, were you able to find the associated code?. If not, open the main.xml file and change the tab from Graphical Layout to main.xml (available at the border between editor and the console window). So, how the code looks like? If you are familiar with XML or HTML, you may see a somewhat similar style but absolutely different content. For others, it may appear totally new! No problems, we do not have to worry about all the details. Let’s analyse! The code declares every component using predefined tags. Just like an HTML code, every statement in this code has an opening and a closing tag (except the first line), i.e., it starts with <tag1> and ends with </tag1>. Every statement within these tags declare the components which constitute the component defined by the tag. Remember the hierarchical model we discussed before! This is a declaration with which almost every xml file starts with, declaring its version and encoding style. Since it is not a tutorial on xml, we will take it as a line of text which we have to include at the top. This line basically declares a Linear Layout for the entire screen, a top-level component which can itself have various components within it. All the other components like Buttons, TextViews can be a part of a Linear Layout. A Linear Layout can have a linear layout within itself too. Since we have to place various components on the screen, we have to declare a linear layout for the entire screen. That’s why, its opening tag is situated in the very beginning of the code. Just check out the last line of the code. What do you see? Yes! It’s the closing tag for this linear layout, justifying the claim that it’s the highest level component in the code. The rest of the statement basically sets some of the properties of this layout, by setting the values of the parameters of this linear layout called attributes. Thus, the above statement sets the values of four attributes. Since the first one will remain same for our discussions and is not going to affect us in programming, let’s leave it as it is! Coming on to the other attributes, android:layout_width sets the width, android:layout_height sets the height and android:orientation sets the orientation of the linear layout. In the code above, both the height and the width have been set to fill_parent, a keyword to ensure that this linear layout is the topmost level component which fill the screen entirely both in width as well as height. I hope that you can make out the use of vertical orientation. If not, try to change it to horizontal and explore! This is the line of text which declares the TextView which is responsible for the text displayed on the screen. It also has various properties like width (fill parent to ensure that it fills the entire width), height (wrap content to ensure that the height is adjusted automatically according to the length of the content) and text whose value decides which text to display. We will see why it has such a strange value in the next post. If you can make out, please comment! Also, since this TextView will not have any other sub-component, we can use a self-closing tag as used above. A self-closing tag looks like <tag2 />. Please note that this discussion is not at all necessary for the development of the apps as we can always use the WYSIWYG editor and forget completely about what goes in the back. My motto for discussing the code was just to tell you that it just doesn’t happen out of the blue, there’s something which is actually doing the things that you are seeing in the WYSIWYG editor. OK! So, we have become familiar with most of the code except the value of the text attribute of TextVIew. In the next post, I will discuss it and also, look at some other ways of changing the text displayed on the screen by a TextView. This entry was posted in Layout (Android) and tagged Android, Layout, XML. Having talked about the project structure and various other basic concepts in the earlier posts, it’s time now to move towards the actual development of the app. So, How should we start? Should we simply start coding? According to me, the answer is NO! The first thing that decides the success of an app is its GUI (Graphical User Interface). For those who are new to this word, it refers to the intermingling of design and interactive components, i.e., an app with a nice GUI will have the required number of menus, buttons and other interactive components placed according to a proper design. The effort should be made to ensure that the GUI reflects the purpose of the app. Also, it should be user-friendly, i.e., user should not be be made to search randomly in order to access a particular function, rather, the app should be automatically dictating the user where to go to find that function. How to achieve this? This is something that the developer gradually grasps over the course of time. I will try to help by explaining my motives of choosing a particular GUI, though it’s still your personal preference. OK! So, the question is how do we set up a GUI in Android. This is achieved by a file named main.xml present in the layout folder ( in the res folder). So, let’s open it up and explore what it offers to us! The above figure is the image of the editor after opening the main.xml file. The right portion is exactly the same as the screen when the app runs (Remember! We had seen it in the emulator!). An important characteristic of this view is that the changes done in it are automatically reflected in the screen of the app, hence, its also called WYSIWYG (What You See is What You Get). For now, we will be just dragging the various components onto this view, which will automatically change the layout of the screen. The left component called Palette provides all the various interactive components like buttons, text boxes, so on and so forth, which can be dragged and placed on this WYSIWYG view. In this post, I will be just be focussing on displaying a text on the screen. The layout that is automatically generated also shows some text (Here it is, Hello World, HelloWorldActivity!. Hope that you can guess where it came from!). The component which simply displays a text is called a TextView. You can drag the TextView from the Palette( visible under Fom Widgets). There are three sizes available initially (you can choose whatever you want later). This is what happens when I drag a Large Size TextView onto the screen. So, you can simply place a text view by dragging and dropping. You can delete it by selecting and pressing Delete. Ok! Now, let’s try to change the text which is automatically generated. Right click on it and choose Edit Text. In the dialog box that appears, click on New String. 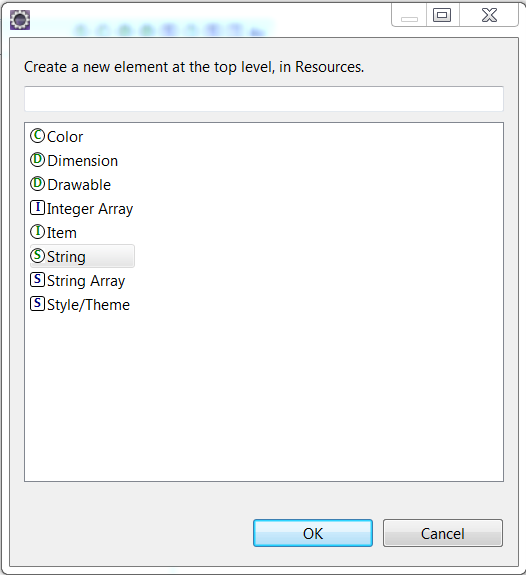 In the resulting dialog box, write the value of the string in the text box beside String. For now, write anything beside New R.string(We will discuss it later) . Click Ok twice. What do you see? There are various simpler ways to do this. But, I mainly wanted to make you familiar with the WYSIWYG editor. We will discuss the other ways as we proceed. 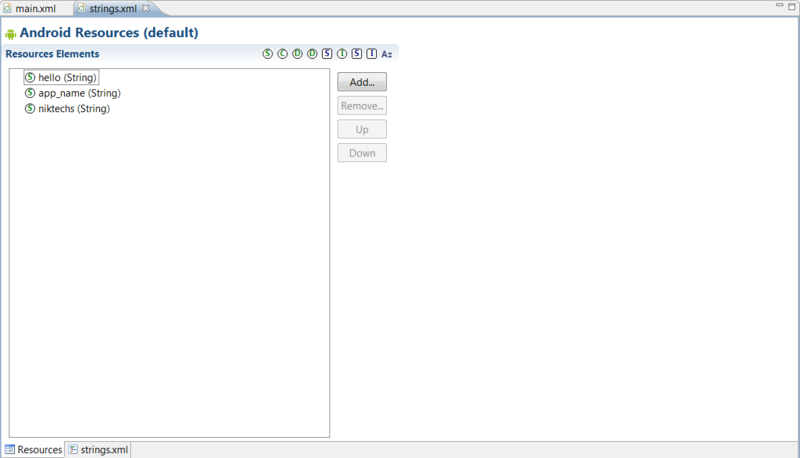 Now, it’s on you to explore the other components and modify their properties. In the coming posts, I will be discussing various other aspects related to the layout. Hoping that the posts are really helpful! This entry was posted in Layout (Android) and tagged Android, Layout, WYSIWYG.